Because chemicals found in the blood stream can also correlate with specific organs, lab work for dogs can help determine more than just blood count. For example, if blood tests show a deficiency in albumin levels, then a veterinarian knows to examine a dog's liver because albumin is produced in the liver. Lab work for dogs can also detect and help identify complex problems with body systems. For example, blood tests can detect abnormal hormonal-chemical responses to environmental and internal stimuli, which alerts a veterinarian to a potential issue with the patient's endocrine system. So when understood in this way, canine blood tests serve as very valuable tools in a veterinarian's toolkit for helping to detect, identify, diagnose and even treat illness or disease. And sometimes identifying changes before your dog shows signs of illness can lead to treatment to help promote a longer, better quality of life. 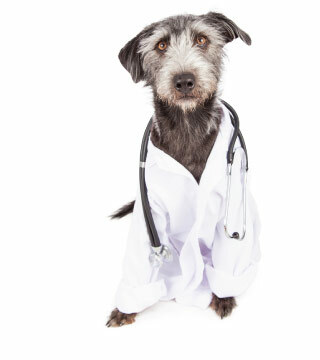 When Will A Veterinarian Recommend Blood Tests? When on a chronic medication: Many medications have the potential to cause changes in the liver or kidneys. If your dog is on a medication every day all year round your veterinarian will want to run blood work at least once a year to be sure your dog's organs are handling the medication well. During senior wellness exams: Blood tests are usually recommended for mature, senior and geriatric dogs as part of their periodic wellness exams. These are extremely beneficial, as we often see senior dogs return to a more youthful state of being when blood tests identify an issue that can be easily treated. We recommend discussing lab tests for your dog with your veterinarian, in order to make an informed decision as to whether or not your canine friend can benefit from blood work. In addition to having veterinary staff on duty around-the-clock to handle pet health emergencies, Advanced Animal Care also has its own in-house laboratory. Although this means we can process all kinds of lab work for dogs quickly and reliably, it is in emergency situations, when time is of the essence, our in-house dog laboratory is most helpful. After all, if we can draw, process and analyze blood work on the premises, we can have the results we need immediately. This increases the chances that we can determine what the issue is, and then implement a successful medical intervention based on the results. In this way, our dog laboratory allows us to be a proactive and timely partner in your dog's health and care.